Elementary Matters: Dictation and Round Robin Proofreading! 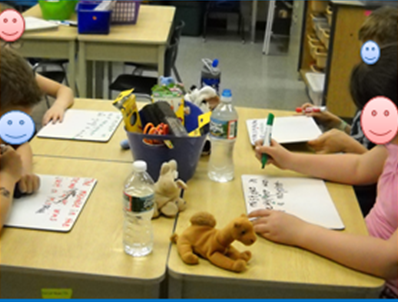 Writing sentences from dictation is a very valuable skill! 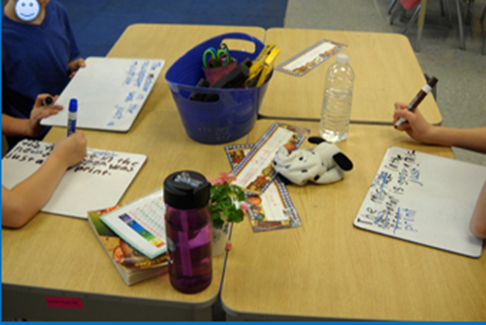 It helps children practice writing sentences and helps them become more fluent writers. It models good grammar for them. It's a great way to catch common errors, and give immediate feedback. (Kids need that, according to brain research!) 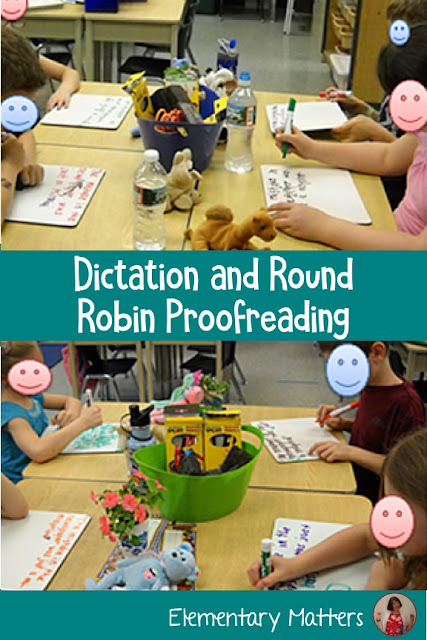 It makes a great review for spelling, punctuation, capitalization, and even handwriting! It helps develop short term memory. Plus, kids love the challenge! I often give dictation sentences when practicing the spelling patterns each week. 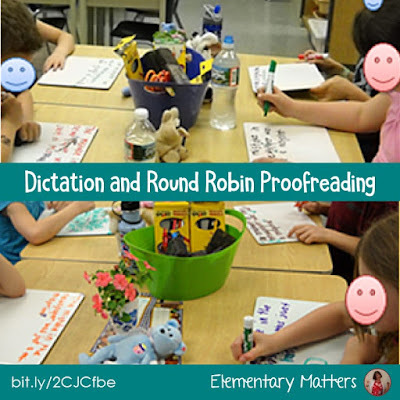 At the beginning of the year, the children can barely remember a simple sentence, but by the end of the year, they are writing complex sentences from dictation. I usually use white boards, that are much more forgiving than paper, although on occasion I use paper. Last week, I noticed the kids were getting a little lazy about checking their work for simple things like capitals and punctuation, and weren't even catching if they left out a word. I decided it was time to increase the challenge. I made sure each child at each table had a different color white board marker. After dictating the sentence, and having them repeat it back to me twice (that's our routine), I gave them a couple of minutes to write their sentences. Then I had them pass their whiteboards around the table and see if they could find anything to correct on the new board. 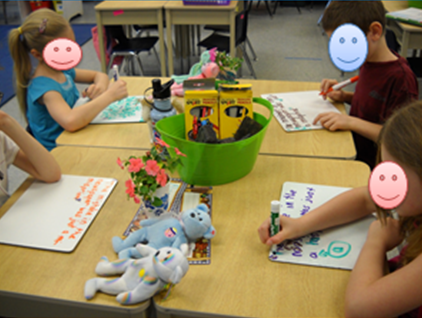 I let them check each board around the table until their boards came back to them with all the corrections. The next sentence I dictated was amazingly more accurate for every child. As they passed their boards, they were finding fewer and fewer of those silly mistakes. Of course, if there were children struggling, I'd never do this activity. I'd go to those students privately and give them a hand. But knowing that their classmates were going to see their work made them a whole lot more focused to do it right to begin with! 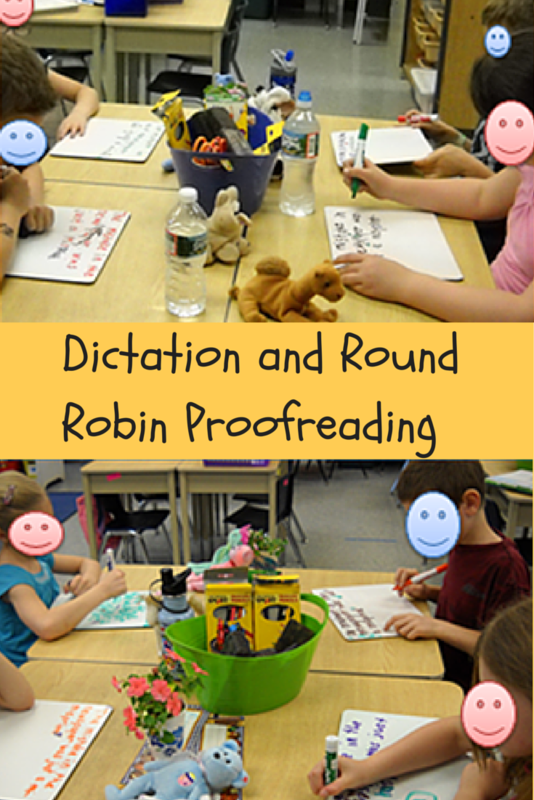 After our final round, instead of correcting mistakes, the children were enhancing the sentences by adding quotations or phrases to make it more interesting. I'm not big on "peer pressure", but sometimes that's just what they need! Great idea! I know the kids I teach would love that activity too! oh!! I love this idea!